In the early years of this blog, I received a wondrous reply from Daryl Spencer (the man who slugged the first San Francisco Giant homer ever). 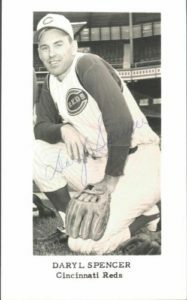 For some awesome, seldom-seen images of Daryl Spencer and others from his era, stop by The Trading Card Database. Wow!I remember the wonderful reply from Daryl Spencer, the man who hit more than 100 homers in a decade-long career (including the first-ever dinger by a San Francisco Giant). I am sorry to learn of the death of your husband. I admired him not just for his Major League and Japanese League achievements, but for his kindness and devotion to through-the-mail autograph collectors and fans of baseball history. I looked him up on an autograph collector website. Of recorded letters sent to him by hobbyists, 236 of 240 received a reply. That’s a stunning 98 percent success rate. Every collector who has shown me the autograph they received from Mr. Spencer is a testament to glorious penmanship. Every letter stands out, easily read. I think a current player today, if answering at all, would be content to return an “autograph” of D—- S—–. Nothing but initials and slashmarks. Most of all, I think those collectors and baseball researchers should be thanking YOU. I’m sure he couldn’t have given all correspondents such attention to detail without your patience and support. While other baseball retirees insist on a cash payment being sent along with a letter, Mr. Spencer was sending cherished gifts to strangers with every autograph – all for free. He will not be forgotten, on or off the field. Thank you for helping to make all that possible. 31 years ago Daryl Spencer wrote me a beautiful letter. I will never forget his thoughtfulness. Tom, your letter to Mrs. Spencer was very gracious & true. Very classy.